Buying an inflatable kayak is different than buying a hard shell kayak, and buying a tandem kayak is different than buying a solo kayak. The world of tandem inflatable kayaks is a wide one, but today we will show you the best two-person inflatable kayak. What Type of Kayaking do You Want to do? You can buy an inflatable kayak for any type of activity. Whether you want a tandem inflatable to fish with a friend or ride a river, you can find the perfect one for you. So what type of kayaking do you want to do? Calm Water: For days on recreational lakes, ponds, and slow-moving rivers, you can buy a recreational inflatable kayak. You can even get by with a rec craft on calm ocean water. These are mostly sit-on-tops. Choppy Water: If you want more performance out of your kayak, invest in a sit-inside. These are great for days on ocean waves, rivers with currents, and windy conditions. Be sure you buy one with good tracking and maneuverability. Whitewater: For whitewater tandem experiences, go with a self-bailing kayak. These crafts differ in that there are holes in the bottom to allow water to pass through. You can plug the holes for flatwater kayaking, but self-bailers are usually bad at tracking. If you aren’t sure, spend the extra money on a tandem high-performance kayak. These will allow you to go on multi-day trips. Not to mention you can use a performance kayak on calm water, but not a recreational kayak on choppy water. Still not sure? This video from Paddling TV’s Ken Whiting will help you choose between a sit-on-top recreational kayak and a sit-inside performance kayak. Are There More Inflatable Tandem Designs? We’re happy you asked! There are 2 more designs we have found to be common among inflatable tandem kayak users. The canoe style inflatable tandem kayaks are completely open like a canoe. They have taller walls and the seats are elevated off the floor. Even the paddles are like canoe paddles with their single-sided blades. An open style inflatable tandem kayak is a cross between the sit-on-top and the canoe style. The sides are taller and the seat is lower to the ground. Some include spray decks to keep you even drier. These are also referred to as easy entry kayaks. If you aren’t sure what type of paddle to use in your inflatable tandem kayak, this expert guide will walk you through the best way to choose. Why Choose an Inflatable Kayak? Manageability: Kayaks can be heavy and awkward to carry. For those that would rather skip the weight lifting lesson, inflatable kayaks can be lightweight lifesavers. They are also good for travel and hiking in. Space: Regular kayaks take up a lot of space. Inflatable kayaks squish down into a manageable size that will fit into any car or apartment. You should be able to enjoy this sport without having to rent a storage unit! Affordability: Many, but not all, inflatable kayaks are cheaper than their plastic or fiberglass counterparts. If you are just learning, inflatable kayaks are an inexpensive way to do so. On a budget, inflatable kayaks are lifesavers! Why Choose a Tandem Design? Children: Many tandem crafts can hold 2 adults and a small child. Or, you can take out your bigger kid as the plus 1. This is a great way to teach the next generation the skill of kayaking. REI shares their expert advice on how to do just that! Pets: Tandem kayaks are great for use with pets! Animals big and small can sit in the spare seat. However, look for seats that can be removed in case they want to lie down. Some kayaks are large enough for 2 adults plus 1 pet to fit inside. Conversation: Some of the best memories can be made on the water! Tandems are great for days you want a fishing buddy and no one available owns a kayak. They are also perfect for weekend getaways with your closest friend! Increased ease and speed of travel: With double the people, you can go twice as fast! At least that is the thinking behind the use of tandems for quick water trips. The power and balance created by 2 people can take you further than you imagine! Convertible Option: A tandem kayak that converts into a solo kayak is great if you are on the fence. Or, if you plan on going out alone on some trips and having a partner on others. These models allow you to place the single seat in the middle of the craft. 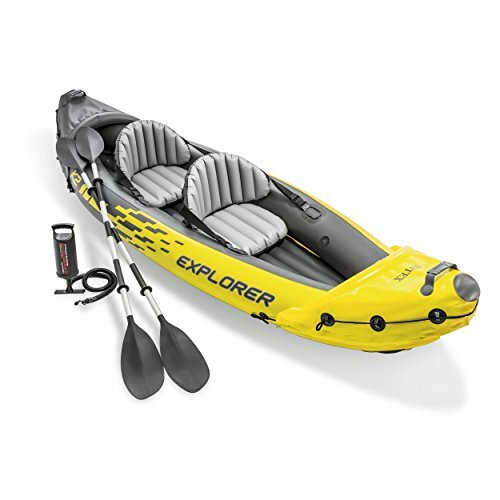 The Intex Explorer K2 Kayak measures 36 inches wide, 20 inches deep, and 10 feet 3 inches long and comes in at the best two-person inflatable kayak. That means it does best in small bodies of water such as lakes and ponds. You can use it on mild rivers, but ensure the waters are calm first! The Explorer K2 comes with a removable skeg and bottom fin, so you can increase your navigation and speed. There are 2 different air chambers, and an inflatable I-beam flooring to increase stability. All said and done, the whole thing weighs a measly 31 pounds. 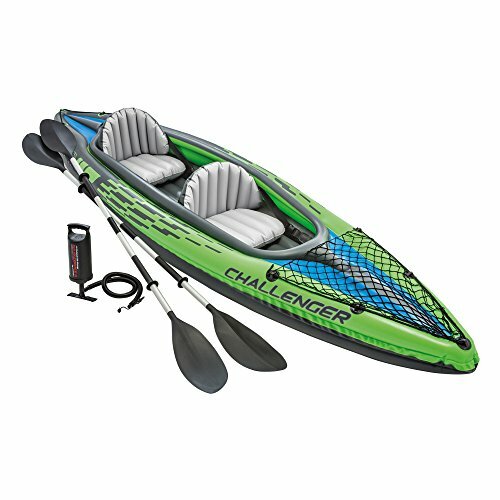 Included with this self-bailing kayak are 2 inflatable seats, 2 paddles, 1 pump for inflating and deflating, and a carry bag. In this craft, the seats are further from the floor than on the Challenger K2. Unfortunately, the Explorer K2 does not include a patch kit. The Sea Eagle SE370 Sports Kayak Pro Package is made for 3! As long as you, your friends, your family, your children, your pets and your gear are under 650 pounds anything goes! This craft is 12.5 feet long by 2.8 feet wide. Use in up to class 3 whitewater! Included with this Sea Eagle are 2 inflatable DKS seats, inflatable spray skirts, repair kit, foot pump, 2 AB30 paddles, and a carrying bag. On the bottom is a drain valve, as well as 2 fins and 2 skegs. These increase both speed and tracking. The hull material is resistant to sun damage, saltwater damage, and puppy claws! Even 2 adults and a child can fit as long as the weight limit isn’t reached. The SE370 has a high center of gravity, and we would classify it as an open style kayak. 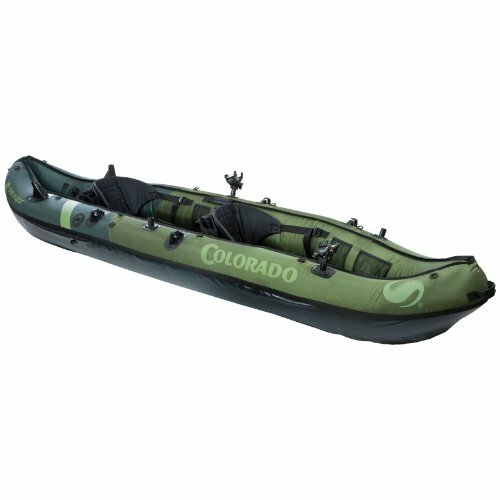 The Sevylor Coleman Colorado Fishing Kayak is a 2-person inflatable kayak made for the sport of fishing. This craft is great if you want to take your buddy, family, children, or pets on the water. The Colorado includes motor fittings for trolling, so it isn’t hard to enjoy a variety of techniques. The construction is an impressive 18-gauge rugged PVC made for use in lakes and ponds. You can even get away with calm rivers! There are multiple air chambers, so if one gets punctured you can still make it home. Also, the bottom is 1000D tarpaulin and the cover is 840D nylon. For a hands-free experience, this Sevylor kayak features Berkley Quick Set rod holders and paddle holders. D-rings are also included if you want to hang up more gear. Storage is in the form of mesh pockets, so not exactly waterproof. The Intex Challenger K2 Kayak is an inflatable 2-person craft. In addition to the kayak, you receive 2 aluminum paddles that are 86 inches long. You also get a pump to assist with inflation and deflation. Finally, you get a repair patch kit for the unlikely chance your kayak is wounded. The Challenger K2 is made out of strong vinyl that resists punctures and other damage. The material is also UV resistant so the sun doesn’t create any weak spots. The measurements of this inflatable are 30 inches wide by 15 inches deep by 11 feet 6 inches long. There are 2 separate air chambers, so if one gets busted the other can still float you to safety. For increased stabilization, Intex included an inflatable I-beam floor. The Challenger K2 can hold up to 400 pounds, and the backrests and seats are also inflatable for comfort. 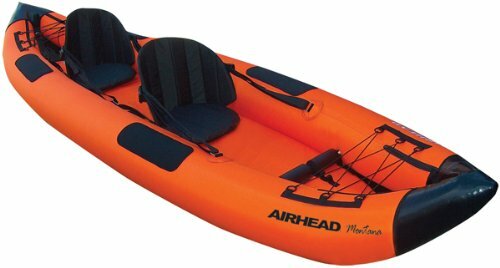 The Airhead MONTANA Kayak is a 12-foot long inflatable kayak built for 2. All that space is great for bigger kayakers. Even average-sized water lovers will enjoy the extra storage space! This 36-pound kayak was designed specifically for lakes and up to moderate whitewater rapids. The MONTANA is made of semi-rigid, heavy-gauge PVC to prevent penetration. Like the Intex models, there is an inflatable I-beam throughout the floor to increase stability. This design, plus a tri-laminate reinforced bottom, is able to hold people, pets, and gear up to 500 pounds. In the bottom of this Airhead is a single drain hole, and on the bottom are 4 fins. To prevent water and sun damage, the MONTANA is covered with a dual-resistant coating. For comfort, there are elbow guards, front and back spray covers, and comfortable seats. No paddles included. Gifts for Kayakers: The Top 7 Gifts They’ll Love!